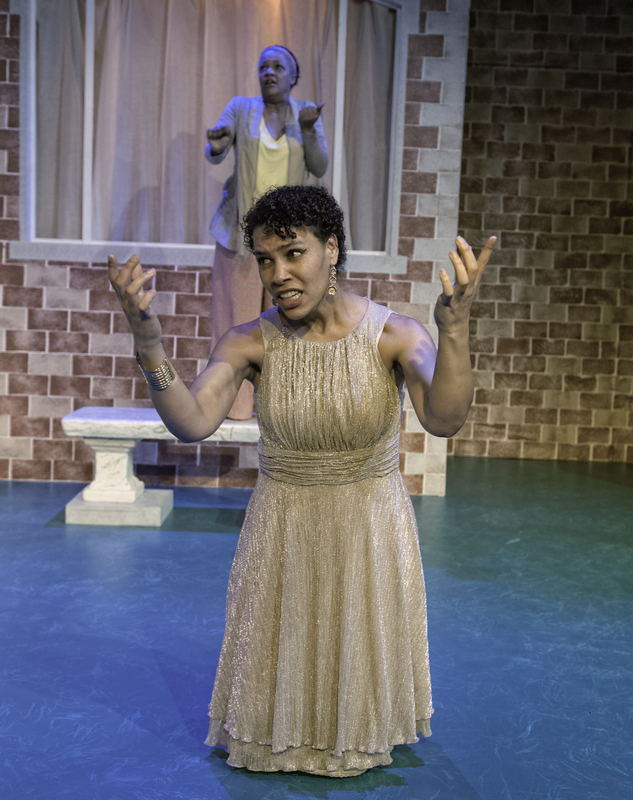 Dawn Monique Williams’ production of “Medea” at the African American Shakespeare Company declares its excellence in its first moments. The set features the facade of an upscale contemporary home that might well be inhabited by a diplomat and his family. A large window is hung with a wrinkled curtain upon which we see a grotesque shadow play of a live woman. The shadow, contorted by the folds of the curtain, difficult to interpret, alienated by the window frame, a play within a play, is grotesque and horrifying. Before we even learn that it is the figure of Medea, the lady of the house, we hear her tortured screams of grief and rage. Thrillingly emitted by Leontyne Mbele-Mbong, they are the howling roar of a powerful wounded animal, powerfully emotive. Listening in horror is the children’s Nurse (Cathleen Riddley). The Nurse declares her fear of what her mistress Medea might be capable of doing and we share it. In only a few seconds, we are drawn successfully into the mindscape of ancient Greek tragedy, where emotions are of more than human size, and the pressure of fate (the manipulating hand of the gods) is felt as a visceral reality, as present as a thunderstorm or an earthquake. The story is familiar: the scorned and enraged Medea, having left her home to follow her husband Jason to a new land and give him children, finds herself abandoned in favor of a powerful mistress, daughter of a King, and takes a horrifying vengeance. The emotional impact of Greek tragedy is rooted in its seeming inevitability: once the situation is clear, and the plot is set in motion, it moves to its conclusion with stunning certainty—we hope against all hope that things will end differently, but the tragedy proves inescapable as each seeming loophole proves to be a tightening noose. It is no accident that these plays have survived for thousands of years and continue to be produced. There simply is no storytelling more effective than that of the ancient Greeks. After the shocking start, we expect to see Medea enter the scene disheveled, tearful, beaten and afraid. Instead, Leontyne Mbele-Mbong emerges from the house with regal grace. Tall, beautiful, perfectly coifed, she presents an image of controlled anger and personal power that is more terrifying than madness. Her neighbors, the excellent Chorus of actresses Danielle Doyle, Sheila Collins and Shani Harris-Bagwell, attempt to calm her even as they realize that she has moved beyond any possibility of human intervention. In a marvelous directorial touch, they totter about the stage in ridiculously oversized high heels, always on the verge of tipping over. It is a clever and effective visual interpretation of the Greek concept of “hubris” (the pride that goes before a fall). Medea alone, towering over the others, appears to be physically and emotionally in control, even as she moves towards an unspeakable act to obtain a victory that is simultaneously the greatest imaginable loss. In this production the story is told with great clarity, and Leontyne Mbele-Mbong as Medea has the necessary physical, vocal and emotional range to encompass this classic part. She gives an impressive and memorable performance, with the help of a highly capable supporting cast. Courtney Flores’ deserves to be recognized for her excellent costume designs, which, on a mostly bare stage, provide much of the productions’ visual excitement. Young audiences, unfamiliar with classic Greek tragedy in general or “Medea” in particular, will find this production interesting and easy to follow. More sophisticated viewers, with high expectations, will not be disappointed. “Medea” by Euripedes, translated by Kenneth McLeish and Frederic Raphael, produced by African American Shakespeare Company. Director: Dawn Monique Williams. Set: Bert van Aalsberg. Lighting: Kevin Myrick. Costumes: Courtney Flores. Medea: Leontyne Mbele-Mbong. Tutor: Elizabeth Strong. Nurse: Cathleen Riddley. Chorus: Danielle Doyle, Shelia Collins and Shani Harris-Bagwell. Creon/Aigeus: Dwight Dean Mahabir. Children: Gabriel Reader and Amir Glenn. Jason: Khary Moye.